Gus Poyet knows all about the busy Christmas period having spent four years at Chelsea as a player. 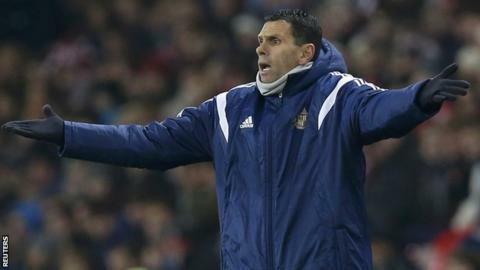 Sunderland head coach Gus Poyet says playing twice in three days over Christmas is a "disgrace". The Black Cats head to Aston Villa on Sunday just 48 hours after losing 3-1 at home to Hull City. "I know that Boxing Day games are a tradition and I accept that and think we should maintain it," former Chelsea midfielder Poyet, 47, said. "But I think that then playing on the 28th is a disgrace. We shouldn't be playing then, we shouldn't." Sunderland, who have won just two of their past 11 Premier League games, are 14th in the table - one place and one point below Villa. Former Uruguay international Poyet made 145 appearances for Chelsea between 1997 and 2001.